A $20,000 scratch-off win will send Richard Hamburger of Owings Mills on a trip to meet his newest grandson. 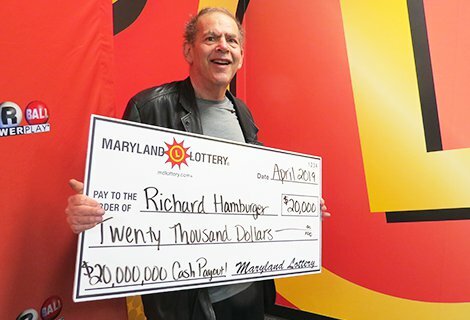 Many a salesman lives by the motto, “You win some, you lose some.” A retired Baltimore County sales representative certainly won “some” from the Maryland Lottery by playing the $20,000,000 Cash Payout! game. Richard Hamburger of Owings Mills just claimed the $10 game’s $20,000 second-tier prize. The grandfather of two plays the $20,000,000 Cash Payout! scratch-off every chance he gets. The 67-year-old also enjoys the $10 WILLY WONKA GOLDEN TICKET scratch-off, the $5 $50,000 Diamonds instant ticket and other $1 scratch-off games. The married player has won $1,000 twice, so he was very excited to win $20,000 with the scratch-off purchased at Sam’s Wine & Spirits located at 11130 Reisterstown Road in Owings Mills. As soon as he confirmed his $20,000 prize, Richard started planning what to do with his windfall.